During a drive to the airport yesterday my colleague remarked positivity works wonders. He said that he has trained himself to think “I hope it will be clear roads ahead” instead of the usual “I hope there is NO traffic ahead”. The fact that we made the 19 odd kilometres commute in under 45 minutes during the evening peak hour rush gave some credence to his statement. Later on I reflected on the excessive use of negative terms that we use daily. Red flag words like no, not, however, but, try and so many more. I call them red flag because the usage of these words triggers off a lot of unnecessary negativity in life. It does not take a lot does it to measure the words and keep them positive. A positive outlook really works wonders; the colleague said that when you are positive the universe somehow conspires to make good things happen to you. For discussion sake let us examine two words in the above list – but and try. There are no buts about but, nobody likes it. See how negative it can be! A but is negative usually and used with positive cancels out the positivity, remember school maths? Positive plus positive is positive, positive plus negative is negative. Check the usage of but in any sentence, “he is smart but…”, in the end the majority will forget the part before the but. The other word try is a 50% word as it has a mix of positive and negative in equal parts. When someone uses the word try he offers himself the two options of success and failure, more importantly he is happy with either outcomes. Think about it, next time you say try, did you really intend to succeed? Should it not be “I will do it” instead of “I will try to do it”. 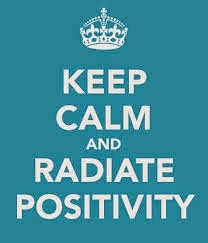 Let us get some positivity into us and spread it around, it is infectious. If the universe will conspire to do good things for us, then it is incidental.